backed by our original expertise and solid management. 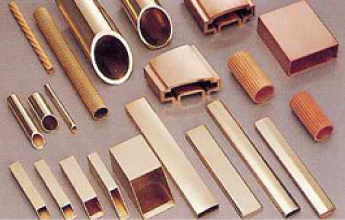 Copper has played an essential role in mankind's long history. Even with today's dramatic changes in industrial structure and lifestyle, the metal is still vital to many industrial fields and daily life in general, and will continue to be used in applications to come. Since our inception, we at mtube have been making steady progress in giving this important material, copper, a practical shape. Mtube now enjoys a exceptional reputation as professionals in machining copper and brass tubes. This comes from two key factors: our customers' full support and patronage, and our commitment in keeping and improving top-notch technology and able-minded management. Our breakthrough ideas and original techniques resound in a broad range of products - not just key and basic materials, but also buildings, vehicles, electric and electronic appliances, medical and healthcare equipment, water tap fixtures, and many other daily necessities. 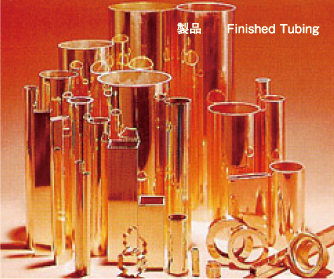 The KM-100, mtube's brainchild, is free from dezincing corrosion that is characteristic of brass. This new metal puts you on the cutting edge.